VALERIE MACON/AFP/Getty Images. Celine Dion attends the world premiere of Disney's Beauty and the Beast at El Capitan Theatre on March 2, 2017 in Hollywood, Calif.
Disney’s “tale as old as time” is back in theaters this week with the live-action remake of Beauty and the Beast. 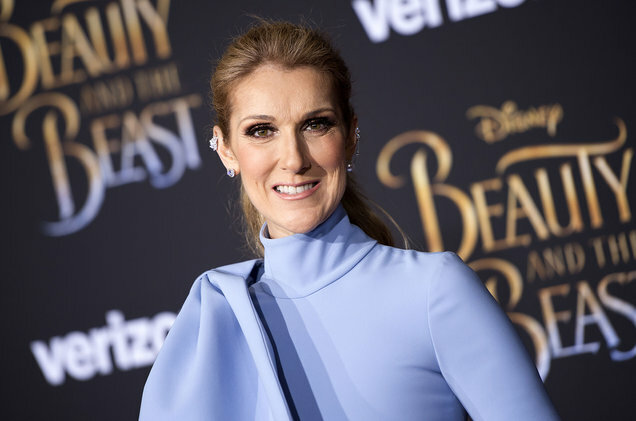 Las Vegas headliner Céline Dion recorded the animated movie’s titular song for the original soundtrack in 1991, and it became one of her signature hits. Now, 26 years later, Dion has again lent her legendary pipes to the House of Mouse for “How Does a Moment Last Forever,” one of the original songs included on the recent release’s soundtrack. Before you hear the track while watching the credits roll, read on for Dion’s thoughts on the song, family time at Disney theme parks and more. Did your kids see the movie yet? Not yet … but I can’t wait to see it again with them. What do they think when they hear you in a film? Well, actually, when [16-year-old] R.C. was 2 or 3 years old, he was getting pretty emotional when he heard my voice. I couldn’t sing around the house. My [6-year-old] twins are the same. And now, every time they hear a girl sing, whether it be any female voice singing, they look at me and ask: “Is that you singing?” I don’t know if it is because they do not want me to be in the room when they listen to me. … So they ask, and every time I answer “Yes, it’s me” … or, “No, it’s not.” It’s interesting … They are so wonderful. Both Nelson and Eddy play instruments—they play piano. They have great voices, and I think Nelson will be a singer. Since the first song became so iconic, was there any pressure about replicating or not replicating the past? At first, yes, absolutely. … I am still very much in love with my first “Beauty and the Beast.” It put me where I am today. It was such an iconic moment, still is and will be for the rest of my life. When I heard they were doing Beauty and the Beast again, I asked myself why. But then I saw the new version with real characters, and it was totally another type of feeling. So I really didn’t feel any pressure, in a way, because it was not the same song. And I am now very honored to be part of this. Take us back to the mindset you were in when you recorded the original song, compared to now. How have the emotions changed? How have you changed? Well, the first time I did “Beauty and the Beast,” it was at the beginning of my career. And it was a duet with Peabo Bryson, whom I still admire a great deal today. And I think of him often, especially now, and I thank him again for allowing me to sing that song with him. Now, with this new song, my emotions have changed. Life changes—you grow, you get older, you get more mature. You have more life experience. I am a mum … so it changes my whole way of seeing things. We’ve seen that you enjoy lots of Disney theme-park time with your family. What’s your favorite ride? Every single one of them! When I go to Disney with my family, I reconnect with the child in me. Who doesn’t? The iconic Canadian songstress served as a mentor for Team Gwen for the first time on Monday's The Voice, and the former No Doubt frontwoman marveled at the opportunity to learn from her idol. "I have the real Celine Dion right here! I'm so honored to have you here, it's unbelievable how many people love you," Stefani gushed. "I'm here to learn from you today." One of the things the Voice coach appreciates about Dion is the way her music has affected people, and the true scope of its influence across the globe. "Her music speaks to the world and transcends all these language barriers," Stefani said in a solo interview. "It's just incredible to be around someone that's been able to touch so many people. She really is a phenomenon." As excited as Stefani was, the members of Team Gwen were even more dumbfounded by singing in Dion's presence. Hopeful JChosen, who joined Team Gwen after delivering a performance during the blind auditions that got all four coaches to turn their chairs, was particularly nervous to show his skills in front of Dion and Stefani together. "The most nerve-wracking thing about this is singing in front of these legends," he admitted. "It's intimidating." "What I like about The Voice is that I get to be stunned by amazing talents," Dion shared. "This is the new generation, so we really have to take responsibility as mentors to give them some tools." One tool Dion gave was some tips on crowd control. Taking the mic during the mentoring session, she performed some moves that showed her famous stage presence. "Intimidate the crowd," she advised. "Get close." She also advised the performers to keep their eyes on the crowd, even breaking out a sultry little dance to pull their focus up. "I tried so hard to get undressed for you to look at us!" Dion joked. "But honestly, you did an amazing job." After the show was done, the "My Heart Will Go On" singer shared her appreciation for Stefani on Twitter, writing, "I love working with you @gwenstefani! We have so much fun together! Recently, Stefani opened up to Seth Meyers on Late Night about Dion's participation in the show, and how she's "the ultimate person that you would want to be on there." Check out the video below to hear more. 0 Response to "Celine Dion Talks About Her 'Titanic' Sweatshirt"